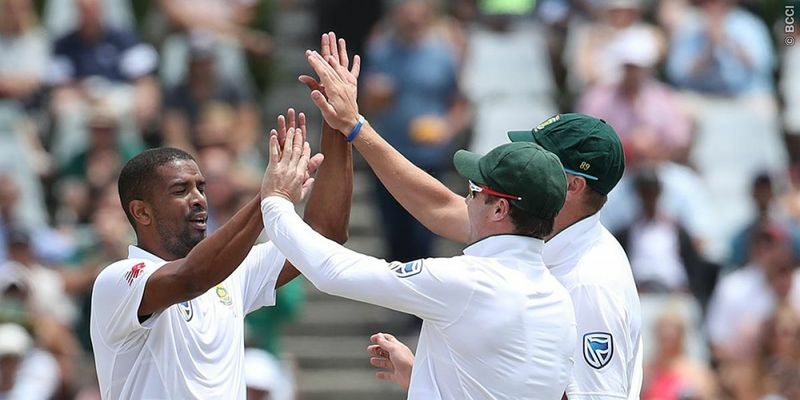 Vernon Philander picked up six wickets on Day 4 of the first Test in Cape Town to give South Africa a 1-0 lead in the three-match series. After Indian bowlers managed to restrict the hosts to a minuscule 130 runs setting them a 208-run target, the batsmen faltered once again to bear a 72-run loss. India arrived in South Africa with the anticipation of doing something special and Bhuvneshwar Kumar set the ball rolling by picking a wicket in each of his first three overs to leave South Africa stranded at 12 for 3. However, AB de Villiers and Faf du Plessis hit their way out of trouble with a 112-run partnership before Jasprit Bumrah grabbed his maiden Test wicket by getting the better of de Villiers for 65. However, the bowlers failed to sustain pressure for long and that resulted in the run rate staying close to the 4 rpo mark. Quinton de Kock (43) batted well lower down the order and he was ably supported by Vernon Philander (23), Keshav Maharaj (35), and Kagiso Rabada (26), who all made useful contributions lower down the order to guide the hosts to 286 in the first innings. While Indian fans would have been happy about the Indian bowlers’ efforts, the impending performance left them stunned as the team lost three wickets for 27 to give the hosts the honours of the day. India started the Day 2 on a cautious note and didn’t let South Africa build up any sort of momentum by protecting their wickets. However, their scoring rate was lackadaisical as they could manage to score just 48 runs in the first session of the day. Although the hosts managed to pick up three early wickets in the second session to reduce India to 92 for 7, but an eighth-wicket partnership of 99 runs between Hardik Pandya and Bhuvneshwar Kumar helped India script a spirited comeback, as they finished on 209 in 73.4 overs, just 77 runs adrift of South Africa’s first innings score. By stumps, that advantage had been extended to 142 runs, with the South Africans progressing to 65 for 2. Pandya could do no wrong on the day as he dismissed the opening duo of Aiden Markram and Dean Elgar to give India a slender hope of making a comeback in the match. The city of Cape Town, which has been experiencing severe drought from last some days, were blessed with a constant downpour, but that resulted in washing out of play for the entire third day, leaving South Africa on their overnight 65 for 2, with a lead of 142 runs. While the meteorological forecast suggested that the game might become possible for at least one session, the rain gods didn’t relent and as a result, umpires decided to call off proceeding at 3.35 local time, 15 minutes before the scheduled tea break. The umpires also decided to make the Day 4 a 98-over affair in the anticipation of hosting as many overs possible. As expected, when the covers came off, the bowlers would have had a huge smile on their face with what the wicket was going to offer. Starting with a score of 65/2, Amla was sent packing in just the second of the day and with just 30 runs added to the score, Rabada, du Plessis, de Kock, and Philander rejoined him. De Villiers kept adding runs to score and managed to guide the score to 130/9, when the injured Dale Steyn walked out much to the delight of the home fans. However, it did not really matter since de Villiers was caught at deep mid wicket while attempting a slog hit to call curtains on the SA innings. Chasing 208, India got off to a decent start with the openers getting to a score of 30 before Dhawan threw away his wicket on yet another short delivery. India’s misery was compounded as over the next five overs as Vijay and Pujara were sent packing as well. With Kohli and Rohit at the crease, India started consolidating the innings again and managed to guide the score to 71/3 before, keeping with the trend of the game, India lost Kohli, Rohit, and Pandya in four overs. India, however, fought back with a brilliant partnership between Bhuvneshwar Kumar and R Ashwin that saw the required runs reduce to 76 before Philander dismissed the latter for 37. The SA pacer then claimed two consecutive wickets in the same over to secure a 72-run victory for the hosts.